Suicide risk is greater among alcoholics than the general population. Up to seven percent of those diagnosed with severe alcohol use disorders die by committing suicide each year. According to statistics, drinking alcohol increases the risk of suicide. At least one-third of all people who committed suicide met the criteria for alcohol abuse disorders. Of those medically treated after a suicide attempt, alcohol use disorders were found to be a significant factor. 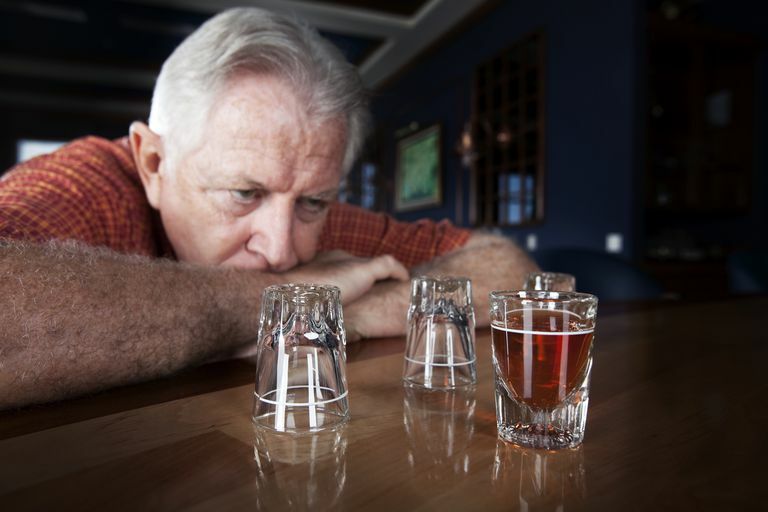 Now there is evidence that suicide risk among alcoholics increases as they become older as well. Middle age and older alcoholics are at a significantly higher risk for suicide compared to younger alcoholics. This could prove to be a significant factor for baby boomers, many of whom have substance abuse problems, as they begin to reach retirement age. The statistics are the result of a study published in Alcoholism: Clinical and Experimental Research. Lead author Kenneth R. Conner, assistant professor at the University of Rochester Medical Center notes that "This was the first study of a sample of adults across the age spectrum that explicitly focused on factors that increase the risk for suicide and medically serious suicide attempts associated with ​alcohol dependence." For the purposes of the study, a medically serious suicide attempt was defined as one that required hospital admission for up to 24 hours. It also needed to meet one other criterion that described the type of treatment received. "Data were gathered from medically serious attempters because they are a subgroup of suicide attempters who engaged in the especially dangerous behavior, suggesting a high intent to die," said Conner. Even if not successful the first time he notes that the risk of "dying in subsequent attempts" is higher. In general, adolescents and young adults are at the highest risk for attempted suicides throughout the world. Yet, most of these attempts do not result in death. In contrast, though the attempts may be less frequent, older adults are at higher risk for completed suicide. To researchers, this reinforced the idea that there are different patterns related to age and suicide. This finding was backed up by a later 2017 study which found an increase in suicide attempts in older people who did and did not have substance abuse problems. Among the concerns is the fact that the compounding life experiences of older alcoholics are not the same as their younger counterparts. Placing all ages into one group is not an accurate way to gauge the suicide risks of either alcoholics or non-alcoholics. The Rochester researchers examined data gathered by Annette L. Beautrais and colleagues for the Canterbury Suicide Project. This is a case-control study of suicides, medically serious suicide attempts, and randomly selected comparison subjects from the Canterbury region of New Zealand. All subjects in the study were 18 years of age or older: 193 (149 males, 44 females) had died by committing suicide; 240 (114 males, 126 females) had made a medically serious suicide attempt; and 984 (476 males, 508 females) were controls. Researchers compared demographic and diagnostic variables. The results found that there is indeed a link between alcohol dependence and suicide becomes amplified with age. Increased age also amplified the association between mood disorders and suicide. Overall, researchers in this field continue to look at the associations between age, alcoholism, and suicide. Many are concerned that we must also account for mood disorders such as depression, which can also make older adults more vulnerable. Cheung G, et al. Predictors for Repeat Self-Harm and Suicide Among Older People Within 12 Months of a Self-Harm Presentation. International Psychogeriatrics. 2017;28:1-9. Conner KR, Beautrais AL, Conwell Y. Moderators of the Relationship Between Alcohol Dependence and Suicide and Medically Serious Suicide Attempts: Analyses of Canterbury Suicide Project Data. Alcoholism: Clinical & Experimental Research. 2003:27(7):1156-1161. Are There Gender Differences in Suicide and Suicidal Behaviors? Could You Tell If Someone Is at Risk for Suicide? Has the Rate of Suicide in the U.S. Risen?